the last week has been a blur! the kids started school yesterday, and i have to say that the rushing around, the driving, the parent meetings, the forms to sign and checks to write really made me miss the simplicity of summer days! although yesterday was a mad house because it was the first day of school, (and we have decided to put our kids back in their "old" schools, which means a 20 minute ride in the morning and afternoon), i am really looking forward to the next few weeks as we settle into a routine and things get a little more... predictable. i wanted to share with you another pinterest board + phone consultation success! 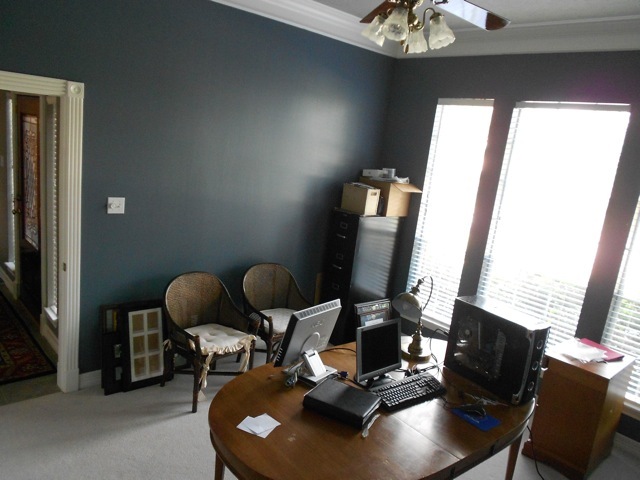 my client contacted me, needing help rounding out an office redesign project that she had begun. she admitted that she was "stuck" and needed some ideas to make the room feel more polished and functional. but she was struggling with layout, lighting, and wanted the room to feel more cozy. *adding a comfortable chair to the lounging zone with a table and a lamp. *bringing in some storage to the back wall of the room---office storage behind the desk and media storage for the lounging zone. 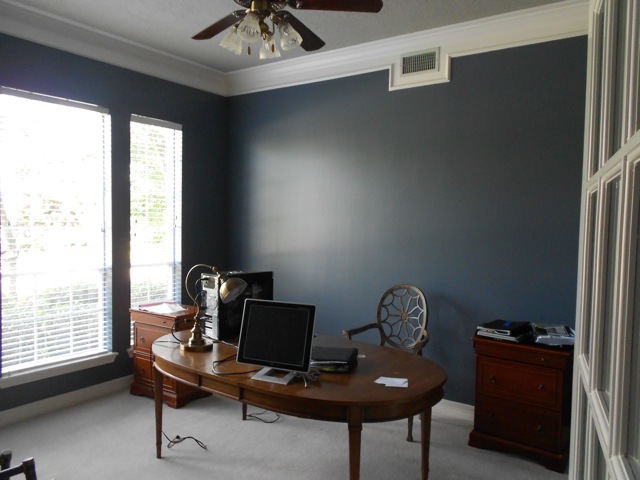 as you can see, a slimmer desk in wood tones was purchased and placed to one side of the room. this really opens up the room, and allows a lounging area near the window. storage, accessories, and a new desk light really add to the eclectic, collected masculine feel of the room...my client did an amazing job of styling the room, don't you think? 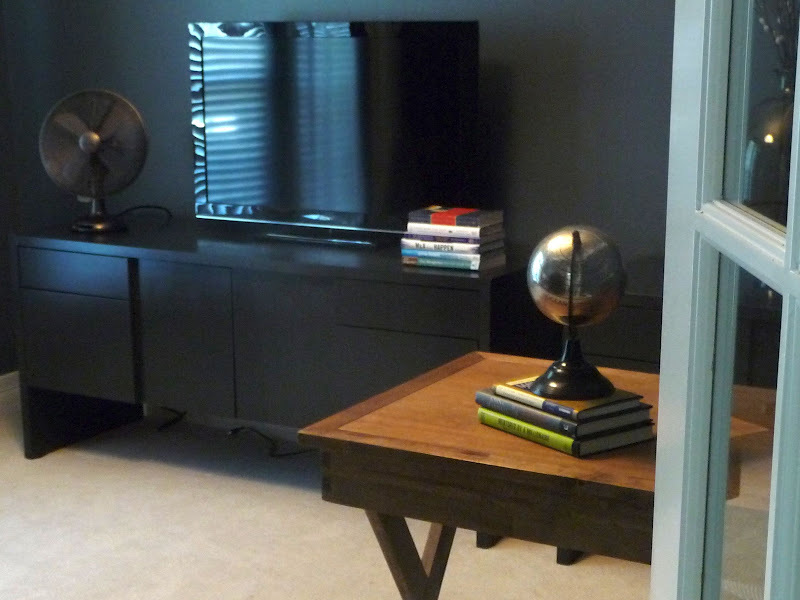 a new light fixture really changes the feel of this room! 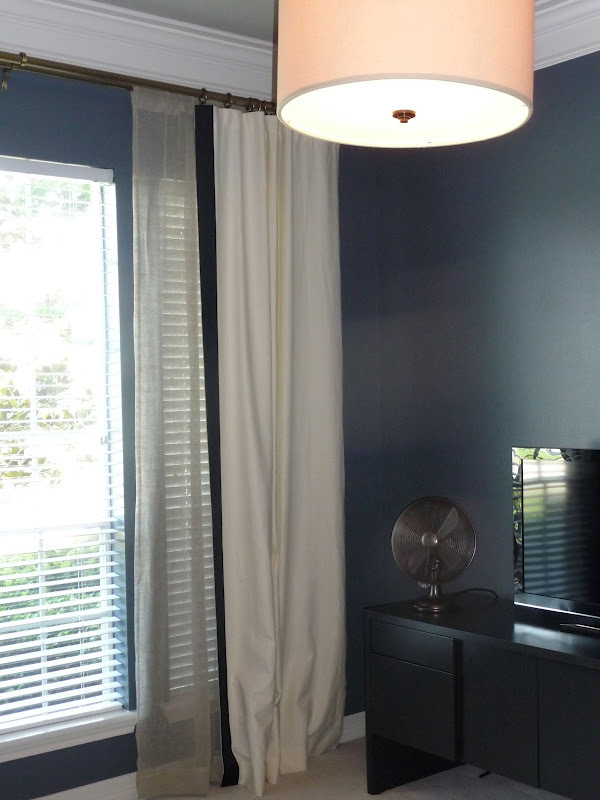 notice the simple banding on the drapes? little addition like this can take something that is very ordinary and make it feel custom. 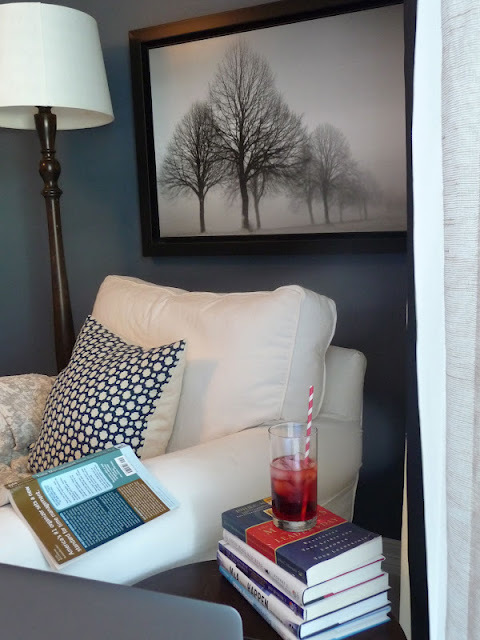 a cozy, simple chair, new drapes, and some art bring on the COZY. i don't know about you, but i would love to curl up with a book here! i know i always say this, but it REALLY is amazing what a little bit of professional design guidance can do! are you interested in working together on a room in your house? 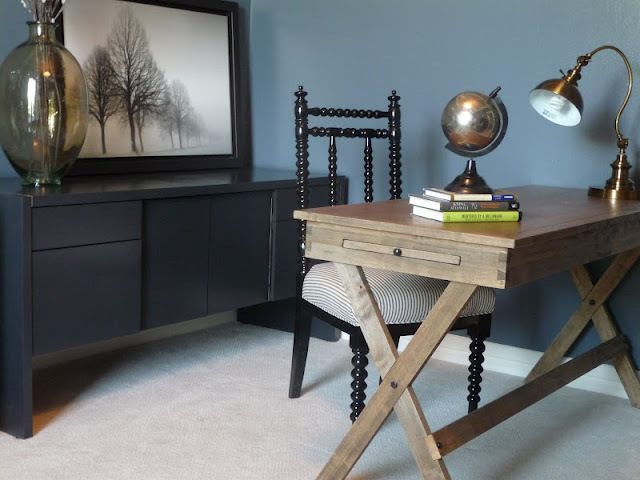 i will have openings for full room designs starting in mid-october, but i am available anytime in september for a pinterest board + phone call or a "regular" phone consultation! I agree. Def a cozy room to read a book! Do you know where the desk is from? Beautiful work! Well done by both of you. WOW! What a difference! I love that desk! Do you have a source for it? hi everyone! 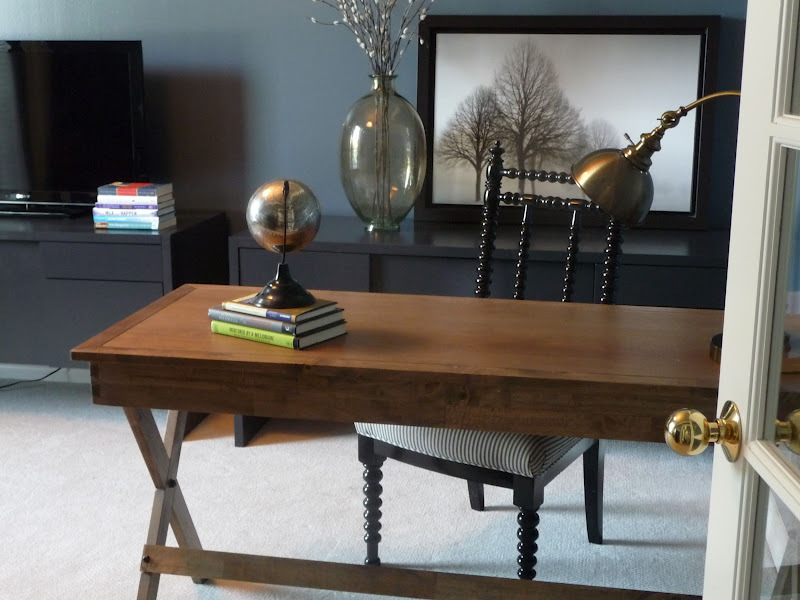 the desk of from world market. it is called the "campaign" desk! Autumn, it is so fun to see you work your magic! You have a wonderful eye and it must feel great to see what a client can do with your ideas once you have shared your vision. This room is perfect! looks great! 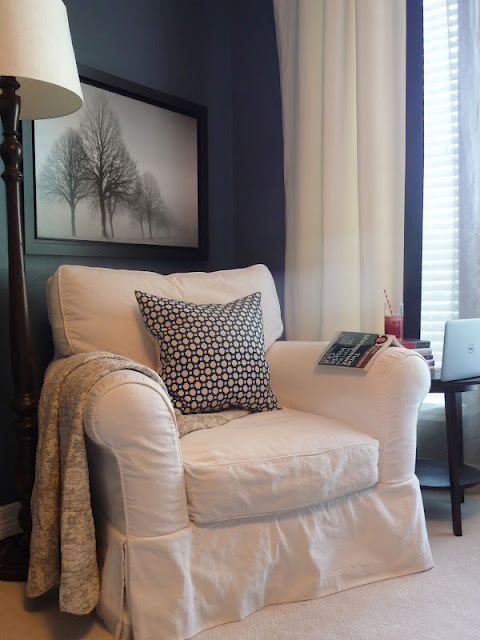 i love the wall color and the lighter fabric on the chair! It is indeed a masculine office. Simple yet just right for the guys. Thanks for sharing this concept. opinions please!! i need you! so...i've got some BIG news.